The NANOPTO group at ICMAB is searching a physics/nanotechnology graduate or an engineer to work with them in the design and fabrication of photonic crystal. This project is oriented to the improvement of a silicon photomultiplier by the design and fabrication of a photonic crystal, based on strong interference effects. Particle detectors often rely on the detection of UV to IR light generated by particles as they travel and interact through a medium. Silicon photomultiplier is the technology of choice for sensitive detection of visible light but is currently limited by its small area of collection. This project aims at improving the efficiency of these photodetectors by developing a “light trap”. 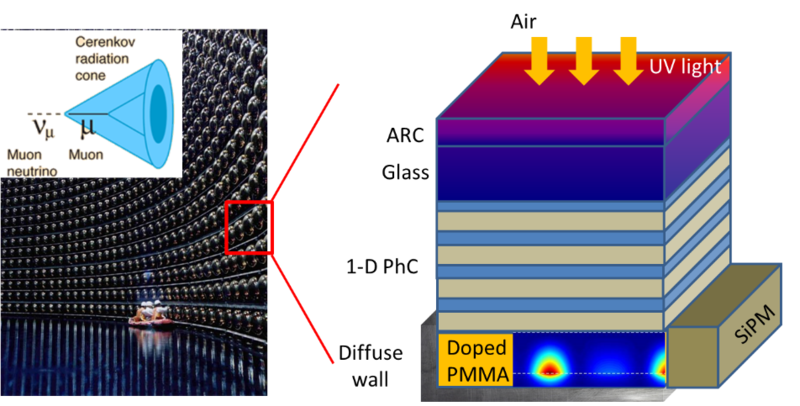 In this light trap, a small Silicon photodetector is coupled to a much larger disk of PMMA doped with a wavelength-shifting fluorophore and covered by a photonic crystal. This scheme will help collect all the UV radiation, convert it into visible radiation trapped in the PMMA disk and eventually detected by the silicon photodetector. Modeling and design of the photonic crystal to maximize the light trapped inside the disk. Fabrication of the photonic architectures using physical deposition techniques. Optical characterization of the final trap and implementation in real photodetectors. Candidates must possess a background in physics or engineering with studies in photonics, materials, optics… Specific Knowledge in numerical simulation and programming (MATLAB) will be appreciated. The selected candidate will have a contract up to 1 year.